Well, we did not make it church today – not the way we normally do anyway. 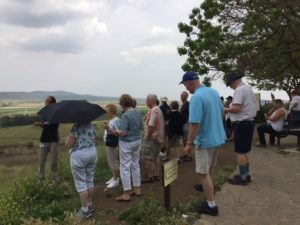 We sang a worship song and prayed on the bus, read scripture, fellowship together, and listened to a few sermonettes as the day went on and, but we also shopped, talked to soldiers, drove past tanks and mine-fields…so not the usual Sunday at all. We are all quite used to being on the bus and ready to roll by 8m. Today we headed north to the border with Lebanon and Syria. It just so happens that the Naot shoe factory (a kibbutz actually) is along the way. Half an hour and many pairs of shoes later we were back on the bus. This a biblical tour, so I’m still trying to figure out how to connect the scriptures with getting a deal on Naots. 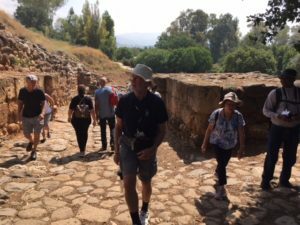 Our first stop was at Tel Dan – the ancient Canaanite city of Laish, which was taken over by the tribe of Dan. 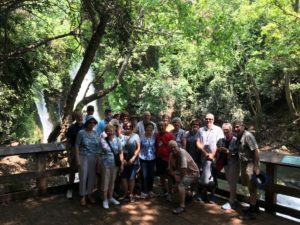 It is a site that offers a nature walk with a sip from one of the springs that feed the Jordan river, impressive history of the Northern Kingdom and also the oldest Canaanite city gate in the world. Entering the gate of the city of Dan. Practicing how to sit in the gate as a proper person in position of authority. 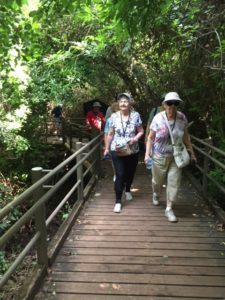 Enjoying the nature preserve at Tel Dan. 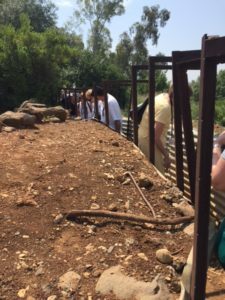 Testing out the trenches that look over Lebanon – a little too snug for comfort. 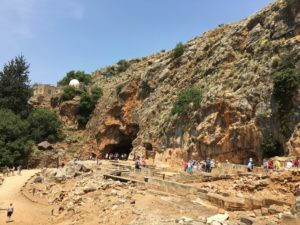 Next we stopped at Banias – the ancient Caesarea Philippi, where Jesus took his disciples and asked them who they believed him to be. 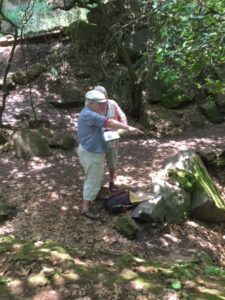 We saw the “gates of Hades”, enjoyed the beautiful water springs, noticed the Damascus Tower and squeezed in a bit of nature hike to a beautiful waterfall. This is the Gate of Hell, which will not prevail over the church, which will be built on the rock, which is the declaration of faith in the person and work of Christ. 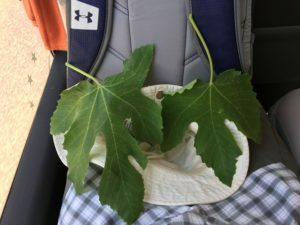 Eve’s and Adam’s version of fig leaves – picked off one fig tree. 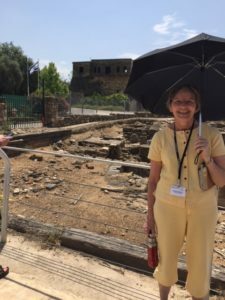 Behind Maaike is the tower that marks the road to Damascus (only 80km from here), by which Paul would have passed on his way there to arrest those Christians. I think I will sketch that. 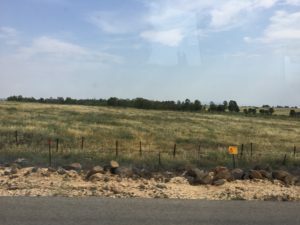 The Golan Heights area offers views of army compounds, soldiers, mine-fields, and tanks and we even got to see some practice maneuvers with trucks going through smoke screens. Looking over the thin strip of no-man’s land into Syria. 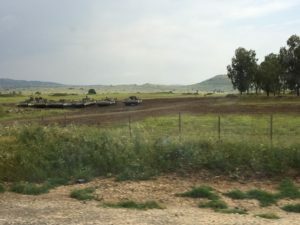 One of things you see driving through the Golan Heights. 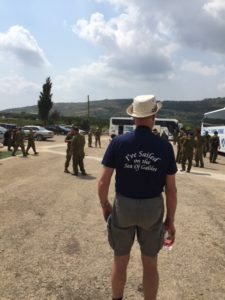 At our lunch stop we met a group of friendly local soldiers and what do you know, the one I started chatting with said, “I’m quite interested in Christianity”…talk about an open door! It is important to know that those fences with yellow warning signs mark off mine fields. We drove back to a beautiful view of the Sea of Galilee, a quick stop to pick up some za’tar, and we still made it home with an hour and half before supper, so some of went to cool off with a swim in the Sea of Galilee. It’s a good thing we are Canadian, otherwise the water might seem way too cold! We agreed that it was very fresh. 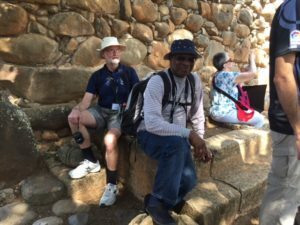 Hoping for a good night of sleep and a great day in Cana, Nazareth, Mount Meggido and around the Jezreel Valley. Thank you so much for your updates Ingrid!!! I hear from you, from Brian, and I am reading your scriptures as well which gives me a microscopic peek into the Holy Land. Beautiful.